One of the good things about living in a place where the sun shines at least three hundred days a year is that you can almost always practice yoga outside in the early morning hours. And if you have a roof top garden like I do, then you can be certain not to be disturbed. Except for the occasional bird that flies by, and maybe sits down on one of the olive trees, or one of your cats trying to sneak up on it, there is nobody there to bother you. Silence and tranquility. I walked up the stairs this morning looking forward to an hour of peaceful stretching and relaxation. The cats did not follow me and I was happy. I was going to enjoy an hour of being alone, but as I stepped outside I saw that someone had beat me to it. Pomi! There was tiny Pomi in downward facing dog position. 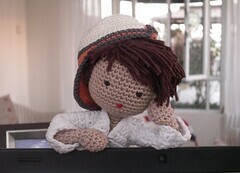 My little crochet guy a yogi. I watched him for a while until I felt I should announce myself. He did not answer but continued his practice as if I was not there. “No, no, of course not!” I assured him. “I live in that room, remember and I like to look outside, you know.” Pomi gave me a questioning look. “Maybe we should get you a proper yoga mat.” I looked at the mat Pomi was sitting on, it was a little carpet which I recognized as the mouse pad the children had given me a couple of years before and I had long forgotten about. ” In your drawers.” I could not help but smile. Oh he won’t! I am sure he won’t !!! Pomi is clearly much better at yoga than I am! Pomi is just too much. What humor! Gadol! Anak! These are Yve’s comments. Say hi to her from me. And Pomi!!! 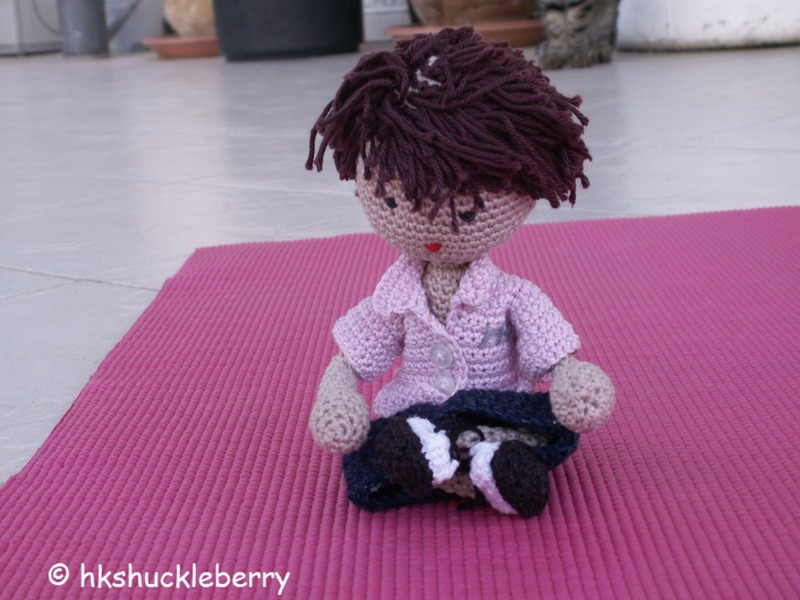 Is Pomi doing ‘ashtanga’ or ‘vinyasa’ yoga? From Yve. Svastha, he is doing svastha yoga, he does what I do, he watched me, remember 😉 .